Thai Kitchen stands tall on the list of Baton Rouge Thai restaurants, though there are several other places that I like equally well for different reasons. Thai Kitchen is the larger, more corporate feeling Thai location that always has a crowd and serves what I thought was consistently good food. They are not a hole-in-the-wall like Rama and they do not offer a buffet like Thai Pepper. Instead, Thai Kitchen serves their sushi bar and Thai cuisine in the well-known Southdowns Shopping Center, right next to Spectrum Fitness and around the corner from a popular watering hole, The Bulldog. The tables at Thai Kitchen are made from carved wood with an Asian flair that matches the rest of the decor, and they also feature karaoke bar which is prominately advertised around the building. Megan accompanied me on a recent trip to Thai Kitchen to see what we could find to satisfy our appetite. 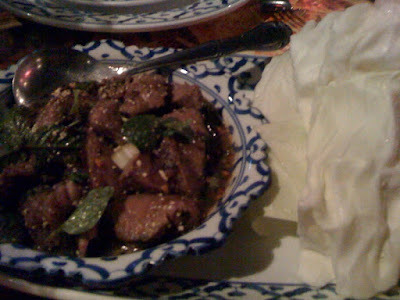 For an appetizer, our knowledgable server recommended the Neau Nam Tok. This marinated and charbroiled beef came out sliced thin and seasoned with Thai herbs, hot pepper, and fresh lime juice. The beef and herbs were served with crispy cabbage to make "cabbage wraps" out of the dish. I have to say that this was my favorite part of the dinner (It was almost better than the company, but not quite!). Not to say that everything else tasted bad, but rather, this appetizer is one that I can see myself getting over and over again. The tender slices of tasty beef oozed with juices that brilliantly blended hot, sweet, and sour all together into one outstanding bit. The hint of lime, the spice of pepper, and the tang of the herbs mixed in a symphony of flavors that orchestrated my taste buds. Yeah, I'm getting that again! 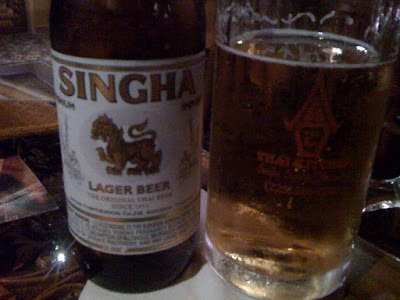 Naturally when I eat at a Thai restaurant, I like to get a Thai beer. For the selection available around here, it doesn't get much better than Singha. Singha is a light lager beer with a sweet, distinguishably Oriental taste that is common in many East Asian beers. The head quickly disappears from the glass and it can easily be mistaken for cheap American swill with many of the same tendencies. All in all, the beer is good, but I don't really drink it except for when I'm eating Thai food. One traditional dish in Thai cuisine is curry. Megan and I shared the panang curry with shrimp. The dish featured a panang curry paste with coconut milk, green beans, and Kaffir lime leaves served with steamed white rice. 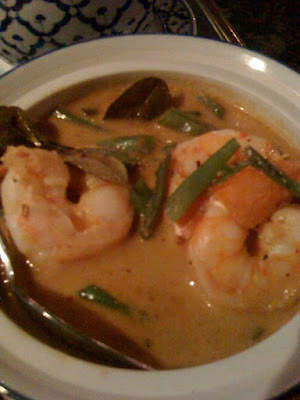 The panang curry is rather mild and the coconut milk and lime flavors stood out and very much complemented the shrimp. I thought it was pretty good and would certainly recommend it or eat it again. The other quintessential Thai dish that you find in America is Pad Thai. The popular dish at Thai Kitchen has stir fried rice noodles with shrimp, bean sprouts, scallions, tofu, ground peanuts, and eggs. This particular Pad Thai did not impress Megan and I much at all. 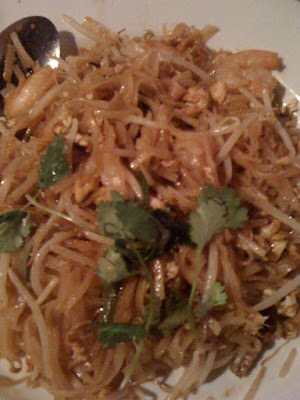 I like Pad Thai a lot, but the taste of Thai Kitchen's dish on this night seemed a little off. It remained edible, but not the special, delightful dish that it usually is. Oh well, I guess you can't win them all. I'm sure that I'll still go back and when I do, you can bet that I'll order the Neau Nam Tok. You're making me hungry for Thai! I always love Panang Curry! they do offer a buffet! both thai kitchen and thai pepper offer a buffet for lunch and menu ordering in the evenings... but thai kitchen will allow menu ordering at lunch too. Good to know! I thought Thai Pepper was the only Thai Buffet in town. Some Baton Rouge food expert I am! You learn new stuff every day! now I am craving Thai Kitchen's lemon grass soup! Thanks a lot! Ship some to Georgia for me!